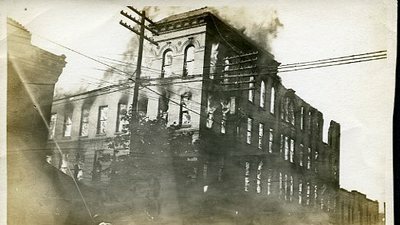 This photograph shows the McCormack Building that was destroyed by fire on July 5th, 1911. The image was taken at 6:00 a.m. It was the home of the Bowling Green Business School and the building was owned by Dr. Arthur McCormack. The building was the only four story building in Bowling Green, Kentucky and was located on the corner of State and 10th Street.